Posted on February 23, 2017 by Jenny Suh / This entry was posted in Informative, New Products. Bookmark the permalink. Grenco Science is doing it right! After the G Pen Elite release, they rolled out a brilliant design collaboration with Badwood and Phil Frost X Burton on G Pen Elite model. It’s simply gorgeous and undeniably badass as well. On top of offering a high quality and super functional dry herb vaporizer, Grenco Science adds style! Act fast- these beauties are limited edition. G Pen Elite boasts the largest fully ceramic chamber on the market, with a revolutionary 360 ceramic heating element that provides fast and even convection vaporization of ground material from all sides. With the capability of setting any desired temperature between 200° – 428°F (93° – 220°C), users can experiment with low temperature true vaporization to explore optimal flavor profiles. This innovative technology opens up an entirely new vaporizing experience with unrivaled performance, taste, and effects. Powered by a combination of the highest grade lithium-ion battery and smart-chip technology, The Phil Frost x Burton G Pen Elite is a high-performance vaporizer that sustains battery life for extended use. Designed and engineered for portability, the Phil Frost x G Pen Elite is the perfect marriage of form and function, making it the ideal solution for efficient vaporization on the go. Collaboration with Badwood, an up and coming streetwear brand, started by young Los Angeles artist, Natalie Wood. The ‘Feels Good To Be Bad’ G Pen Elite for ground material is emblazoned with original yet distinct Badwood artwork. 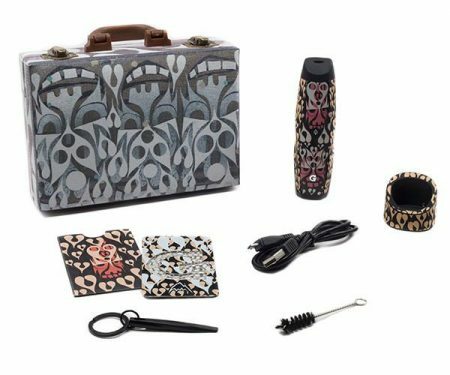 Each kit comes inside a commemorative make-up vanity box with a clutch bag featuring the now-iconic “Badwood Ski Mask” logo, customized accessories including a compact mirror, a bottle opener grinder card, miniature permanent marker, rolling tray, temporary lip tattoos, and adhesive bandages, making it the perfect kit for a girl’s night out. Each Badwood G Pen Elite Vaporizer comes standard with a USB Charging Cable, G Pen Tool, and Cleaning Brush. Experience quick and easy vaporization of ground material on-the-go. See how it ‘Feels Good To Be Bad’ with the limited edition Badwood G Pen Elite Vaporizer! A long-awaited collaboration which has been in the works for over three years. As an admirer and avid collector of New York artist Phil Frost’s artwork, G Pen founder, Chris Folkerts, visited Frost’s studio at an undisclosed location to acquire a 20-piece luggage art collection, which sparked the original inspiration for the eventual collaboration. Burton Snowboards, an industry-leading brand and previous collaborator with G Pen, served as the perfect fit for making this three-way collaboration a reality. Packaged within a miniature suitcase replica of the original artwork, the Phil Frost x Burton G Pen Elite is dressed with Frost’s distinct design aesthetic and is part of a larger capsule collection which includes a full line of limited-edition Burton travel accessories and snowboard. You can find both of these limited edition vaporizers at Sunflower Pipes!